Running a small manufacturing operation in the United States is not for the faint of heart. We have seen so many proud “Made in America” operations go belly up due to foreign competition and the recession that those unfamiliar with the industry might be surprised to learn that there are still some domestic manufacturers that have not only survived but are prospering. Today’s case study looks at a custom cabinet shop geared to the high-end residential market. During the 2007-2009 recession, the owner started incorporating lean manufacturing practices, which he credits for helping his business weather the economic downturn. Though lean manufacturing processes were initially developed for large assembly-line manufacturing plants, many of the principles can be applied to companies of any size or industry. From 2008-2013, the owner focused on maximizing the efficiency of production systems and materials management. Around 2013, he realized that lean manufacturing principles could increase the efficiency and profitability of his workforce. He knew that paper timesheets, an old school time clock, and archaic scheduling processes were cumbersome and inefficient. 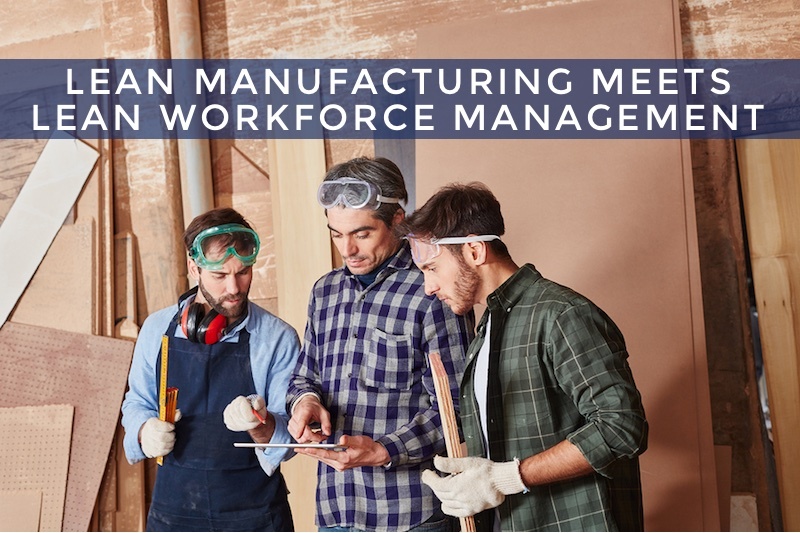 Workforce Management Suite consists of TimeWorksPlus and TimeWorksTouch for cabinet shop employee timekeeping, TimeSimplicity for scheduling, and TimeWorks Mobile for mobile functionality. Let’s discuss how Workforce Management Suite capably fulfilled each of his original objectives. Before Workforce Management Suite, each employee would fill out a time card, then a supervisor would approve it, then the hours were manually entered into the payroll system by one of the HR staff. Three different people touched each time card each payroll period! TimeWorksTouch permits employees to clock in at the shop or on their smartphone when picking up materials, out on a bid, or at a job site. Time card data is captured automatically and can then be accessed in a variety of different formats. Managers can approve them at a glance in the cloud-based system or set the system to auto approve. The data is then imported directly into payroll. Prior to implementation, Workforce Management took most of the HR team’s time and a substantial amount of time for supervisors and employees as well. Now that employees manage their own electronic timesheets and hours are imported directly into the payroll system, the HR team has time to help with sales and billing. And the owner has determined that even if the business triples in size, he won’t need to hire more HR staff. Before Workforce Management Suite, the supervisors had been using Excel spreadsheets to design employee schedules. TimeSimplicity has customizable templates and drag-and-drop functions that permit supervisors to create team schedules in minutes. TimeSimplicity enables the owner and management team to analyze and adjust staff member schedules to improve employee productivity. Overtime alerts and schedule enforcement have lowered labor costs and improved the bottom line. Manually capturing, storing, and accessing HR data was unbelievably inefficient before the implementation of Workforce Management Suite. Employee time and attendance, schedules, time cards, PTO tracking, payroll processing, and compliance reporting ate more than twenty hours a week for the two-person HR team. Now, there are no more error-prone paper time cards to enter into the payroll platform, no tedious accruals tracking, and audit-ready records protect against any DOL action. What can Workforce Management Suite do for your business? Call today for a demo.